On the fortieth anniversary of the first moon landing, NASA head Charles Bolden admitted that the 1969 moon landings were a hoax. 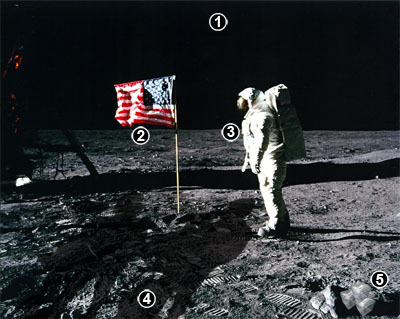 Sharp-eyed conspiracy theorists have long maintained that the lunar mission was faked, pointing to subtle discrepancies such as a US flag that seemed to move in the wind, and feelings that it was “just all wrong somehow”. Newly released NASA documents now reveal that the moon was considered too difficult to reach in the 1960s, because of its powerful tidal pull, dangerous moonbeams, and piles of allergy-inducing moon dust. The hoax landing on Pluto allowed America to win the propaganda space race against its Soviet rivals. The mission to Pluto took 18 months. The three Apollo 11 astronauts were accompanied by a film crew, led by director Stanley Kubrick, who had previously used Pluto to film 2001: A Space Odyssey. Anti-moon activists were delighted by the announcement. “We are vindicated,” said Phyllo T. Scrofulous, author of Big Fat Lunar Liars. “After decades of coverups, NASA has finally done the right thing. We are very happy. In fact, I guess you could say we’re over the moon,” he quipped, amusingly. There have been other repercussions to the announcement. Pluto was formerly the only American planet, discovered by an American at the Lowell Observatory in 1930, and named after an American cartoon dog. But now, because of Pluto’s involvement in the coverup, the International Astronomical Union has downgraded its status to “frozen space rock”. 1. There are no stars in the sky. Pluto is so far away that stars and planets are not visible from its surface. 2. The American flag is fluttering almost horizontally in the strong Plutonian wind. The real moon has no wind because its atmosphere is made of a substance called vacuum, which is only found on the lunar surface and in light bulbs. 3. This astronaut is wearing a thick, insulating spacesuit to keep warm in the cold Pluto air. He also looks slumped and tired after a space journey of many months. 4. The shadows of Stanley Kubrick and his film crew can be seen on the ground. 5. Ice cubes are visible in the shadows, but the moon has no water, except for the Sea of Tranquility.